Faisal Shahzad, 30, was arrested Monday night in connection with a car bomb parked in New York's Times Square. 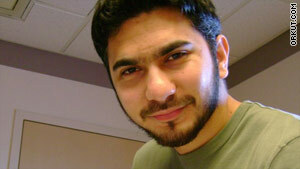 (CNN) -- Faisal Shahzad had two faces, investigators and people who knew him say. He was a suburban father in Connecticut, married to an American citizen educated in Colorado. Wife Huma Mian, pretty and smiling in a Facebook picture, wore a traditional Muslim head scarf and posted on her page that she loved to shop. Shahzad, a Pakistani who became a naturalized U.S. citizen in April 2009, worked as a financial analyst in Connecticut before leaving that job last June. His neighbors describe him as quiet and nice, but a little odd -- a man who liked to jog at night wearing all black and who once remarked that he didn't like the sunlight. 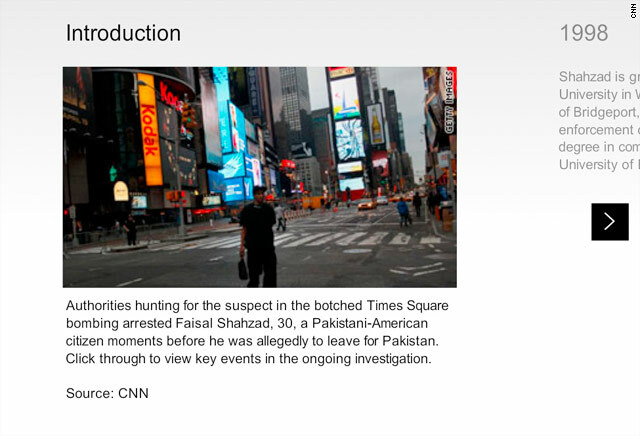 Shahzad is suspected of trying to blow up a Nissan Pathfinder in Times Square on Saturday. He was arrested Monday night at John F. Kennedy International Airport in New York as his flight to Dubai was about to take off, law enforcement officials said. Shahzad, 30, has been charged with five counts in connection with the case, according to documents filed Tuesday in U.S. District Court in New York. The documents say he admitted to law enforcement officials that he attempted to detonate the bomb and that he recently received bomb-making training in the Waziristan region of Pakistan. Shahzad returned to the United States via a one-way ticket from Pakistan on February 3, according to a criminal complaint. He told immigration officials upon his return that he had been visiting his parents in Pakistan for the previous five months, the complaint said. Shahzad has a Karachi identification card, a sign of Pakistani residency, and his family is from northwestern Pakistan, according to Pakistani Interior Minister Rehman Malik. Video: Who is Faisal Shahzad? His father is a retired senior officer in the Pakistani Air Force, Shahzad's cousin, Kafayat Ali, said on Tuesday. The father, Bahar Ul Haq, a former air vice marshal, lives in the Peshawar suburb of Hayatabad in Pakistan. Pakistani authorities in Karachi picked up for questioning Iftikhar Mian, the father-in-law of suspect Faisal Shahzad, and Tauseef Ahmed, Shahzad's friend, on Tuesday, two intelligence officials said. An intelligence source said Wednesday that a different associate of Shahzad also was detained on Tuesday. That associate allegedly was instrumental in making possible a meeting between Shahzad and at least one senior Taliban official in Pakistan last July, a senior Pakistani official said Wednesday. It's unclear where Faisal Shahzad's wife, Mian, is now, although he told immigration officials in February that she was in Pakistan. Shahzad came to the United States and attended college, earning a bachelor's degree in computer applications and information systems from Connecticut's University of Bridgeport in 2000. He earned an MBA at the school in 2005. He started working as a junior financial analyst for Affinion Media Group in Norwalk, Connecticut, in 2006, leaving voluntarily in June 2009, according to Affinion spokesman Michael Bush. In October 2008, Shahzad reported getting married to Mian, who graduated from the University of Colorado-Boulder with a degree in degree in business with emphasis in accounting, university spokesman Bronson Hilliard said. A student from 2000 to 2004, Mian lived in a dorm the first few years, and then in family housing with her sisters her last two years at the school. Mian's Facebook page, which has apparently been disabled, had a picture with her smiling and wearing a hot pink head scarf. Shahzad, Mian and two children and Mian's two sisters lived in Shelton, Connecticut, for about three years, moving out in July 2009, according to neighbor Brenda Thurman. Mian spoke English, but was apparently so insecure about her language ability that she told people she did not, Thurman said. "I never knew she spoke English until it was time for her to move," Thurman said. Thurman saw him in his yard with his children, a boy and a girl, and the family usually wore traditional Muslim attire, Thurman told WTNH-TV. Thurman said her daughter often played with Shahzad's daughter, but she herself didn't have much contact with the family. "He also came out and played with them on occasion. He really loved his kids," Thurman told CNN's "Larry King Live" on Tuesday. She said Shahzad gave her daughter an old computer of his. Investigators were in the process of confiscating the computer on Tuesday, she said. Shahzad's wife told Thurman in July 2009 that the family was moving to Missouri. A few weeks after they left their home, the lender foreclosed on the property and changed the locks, Thurman said. At the Bridgeport, Connecticut, residence where authorities say he lived most recently, agents with the FBI and local police, including members of a bomb squad, conducted a search, and investigators removed filled plastic bags. CNN's Deborah Feyerick, Jim Spellman, Drew Griffin, Joneil Adriano, Samson Desta, Reza Sayah, Jim Kavanagh and the CNN Wire Staff contributed to this report.